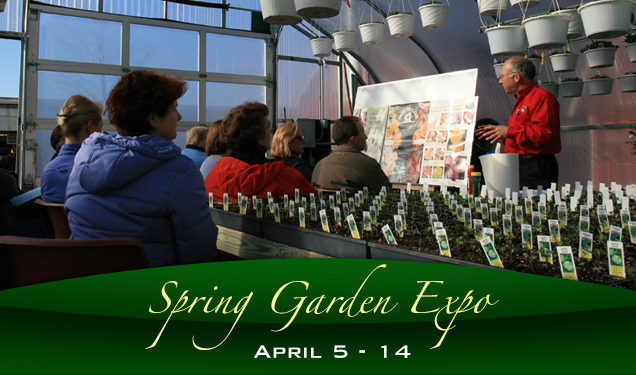 We are eagerly looking forward to the 2019 Spring Garden Expo, coming April 5nd - 14th. Save the dates on your calendar for this fantastic spring kick-off event! Check out our complete class schedule below, and don't forget to reserve a spot in the classes you plan on attending. Space is limited, so make your reservation early before the classes fill up! Reserve Online Now to sign up for any classes. Registration is free, so sign up today! Popular plants and garden design for attracting butterflies and hummingbirds to your gardens. Learn the steps to build gardens with the right colors, textures and locations to attract birds, butterflies and hummingbirds. Join guest speaker Chris Valley from Prides Corner Farm. Discover everything you should know about Hydrangeas. Learn about the different varieties, new varieties, and the best variety for your gardens. Planting, Pruning, Blooming and general care. A MUST attend class! Join guest speaker Rich Bartos from Hopewell Nurseries presents the best of fruit trees. Learn how to feed, prune and protect your fruit trees for optimal rewards of fruit. Join us for a guided tour throughout our greenhouses. Walk through our annual, perennial and vegetable areas and hear just what it takes to care for these plants. A must See, Feel & Smell seminar. Wear your boots! 20 people maximum per group. Learn the proper steps to developing an incredible Vegetable Garden. Demonstrations include choosing the plants for best crops, soil, planting techniques, feeding & weeding. Tips on growing and harvesting the best tomatoes and vegetables for your summer salads and grilling. Bring your boots 45 minutes hands-on demonstration & 45 minutes field/greenhouse training. Rob Dietter of Dietterâ€™s Water Gardens presents the latest trends on watering gardens. Learn about construction, maintenance and designs of the best water gardens for your property. Container Gardening for flowering long lasting blooms. See demonstrations and instructions on constructing container gardens for your sunny and shady areas in your gardens, porches and patios. Learn how to add color, height, and texture to your pots. Clean - up your act! See the demonstration of step by step Instructions for trimming, cleaning, weeding, feeding and mulching your gardens and getting ready for the growing season. Roxanne Harrison, chef, caterer, personal cooking instructor, graduate of the Culinary Institute of America & owner of Roxanne's Gourmet Food Truck will demonstration her cooking skills & prepare a delicious treat for all to enjoy. Fun and exciting cooking class for everyone. Jerry Amorso, representative of Weeks Roses - Rose Grower. Learn about the NEW varieties and top performers of roses. Demonstration includes general care, pruning, and fertilizing and disease prevention. Speaker John Rutte of Rutte Farms from upstate NY will present the top performing perennials for Sunny and Shady locations. Techniques for division, transplanting, and growing your ever blooming perennial gardens. Slide presentation and hand out. Guess Speaker Brian McCall from Bobbex, Inc. will discuss the best products for use to keep the deer, rabbits, squirrels, chipmunks, voles and more out of your property and away from your plants. Dr. Kirby Stafford â€˜The Connecticut Agricultural Experimental Stationâ€™ presents a must see seminar on managing an exploding expansion of TICK and other vector-borne risks! Presentation & open forum. See Demonstrations and instructions on creating breathtaking container gardens using annuals, tropical and perennials. Learn of the many plant options to fit any of your container locations on your patio or in your gardens. Join guest speaker Lydia Gompper from Monrovia as she discusses HOW TO layer perennials for all season color. Learn Basic maintenance, division and general care for perennials. Join us for a guided tour throughout our gardens and greenhouses. Walk through our annual, perennial and vegetable areas and hear just what it takes to care for these plants. A must See, Feel & Smell seminar. Wear your boots! Learn how to recognize insect, disease and fungus on your plants, trees & shrubs. Find solutions to correct any issues before it is too late. Products and advice will be discussed to help remove these problems from your plants. Discussion of ticks and grubs will be presented. Grab your FRESH vegetables and herbs from your patio/porch. Learn how to choose the right plants, how to plant them together & what to plant them in to keep your veggies and herbs growing throughout the season! See demonstrations and techniques for success! Guest presenter Cheryl Mizk of The Connecticut Orchid Society will demonstrate repotting, and basic care and tips on growing your orchids including pest and disease control as well as lighting. Guest speaker Terry Hoyt of Fairview Nurseries provides expert advice and demonstrations on the proper pruning techniques for all trees and shrubs. Learn HOW, WHERE & WHEN to prune your plants! Roxanne Harrison, chef, caterer, personal cooking instructor, graduate of the Culinary Institute of America & owner of Roxanne's Gourmet Food Truck will demonstration her cooking skills & prepare a delicious treat for all to enjoy. Entertaining cooking class for everyone. 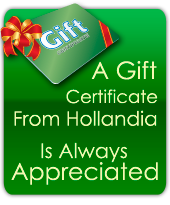 Let the experts help you develop a healthy green lawn. Learn the correct time schedule for fertilizing, weeding, grub and pest control for your lawn. Get the dirt! Hollandia experts will discuss the best proven annuals to keep in your gardens and planters for continual blooms PLUS see the new HOT annuals available this season. A fun filled class with much entertainment. Sal Gilberite from Gilberite's Herb Garden of Easton will present the best HERBS and how to care for them in your gardens and patio areas. A MUST attend seminar!